Want a Fresh Take on the Fae? Check out Court of Shadows! 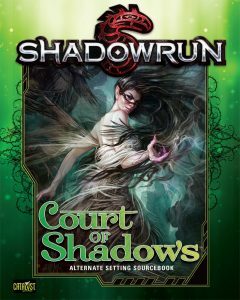 Court of Shadows is a brand new setting for Shadowrun 5th Edition that takes place on a metaplace filled with faeries, the Seelie Court, and rich details and characters. I co-designed the setting with Jason Hardy for this supplement, and contributed a huge chunk of the writing, too. I’m so excited to present this alternate setting, and hope fans’ll dig how I blended inspiration from previous sourcebooks into this unique metaplane. If you’re interested in this supplement, you can follow along by reading the design notes I’ve been writing. For more design notes, you can follow news from Catalyst Game Labs on Tumblr. You have seen it. You have felt it. The dream where you are falling, falling, and you cannot see the ground but you know it is there waiting. You may try to brace yourself, you may try to force yourself awake—you do anything to avoid the impact that keeps rushing toward you. The Seelie Court is the realm of the hidden, the rumored, and the unknown. Fairies, spirits, and enchanted creatures mingle there, building alliances, plotting, scheming, toying with the realm of humans—and with each other. The Court has long held a distant attachment to the material plane, influencing it like a dream influences our waking hours. But now a new connection has emerged, allowing humans to infiltrate the courts and influence its proceedings. At a time when magical power is ever in the rise, the mix of human and fae could set both worlds into a calamitous plunge, and no one will want to be awake when they hit bottom. Court of Shadows is an alternate setting for Shadowrun 5th Edition, emphasizing the magic and intrigue of the Seelie Court. With full setting, character, and plot details, as well as information on using SR5 characters in the Seelie Court, this book presents all-new ways to play Shadowrun and to live in the mystical intrigue of the planes of fairy, capturing the magic of the dream world—and seeing if they can prevent its fall. Court of Shadows is for use with Shadowrun 5th Edition.